The kinase PI3Ka is involved in fundamental cellular processes such as cell proliferation and differentiation. PI3Ka is frequently mutated in human malignancies. One of the most common mutations is located in exon 9 (E545K), where a glutamic acid is replaced by lysine. The E545K mutation results in an amino acid of opposite charge, where the glutamic acid (negative charge) is replaced by lysine (positive charge). It has been recently proposed that in this oncogenic charge-reversal mutation, the interactions of the protein catalytic subunit with the protein regulatory subunit are abrogated, resulting in loss of regulation and constitutive PI3Ka activation, which can lead to oncogenesis. To test the mechanism of protein overactivation, MD simulations will be used here to examine conformational changes differing among the WT and mutant as they occur in microsecond simulations. Understanding how the E545K mutation leads to the increased PI3Ka activity will help us design new candidate drugs for cancer patients who carry this mutation. How? The dynamics and structural evolution of this E545K oncogenic protein, as described by our simulations, might reveal possible binding pockets, which will be then exploited in order to design small molecules that will target only the oncogenic mutant protein. Therefore, our simulation results will be used to identify putative allosteric pockets on the cancerous protein and perform computer-aided drug design for the identification of selective E545K inhibitors. These inhibitors will be further validated by in vitro assays and SPR experiments with the aim to discover novel candidate cancer drugs. PI3Kα, a lipid kinase that attaches to the cell membrane to function, is the most frequently mutated kinase in human cancers. Understanding the mechanism of overactivation of the most common mutation of the PI3Kα protein, E545K, is central to developing mutant-specific therapeutics for cancer. Using MD simulations we would like to gain insights into the overactivation mechanism of the PI3Kα mutant E545K. 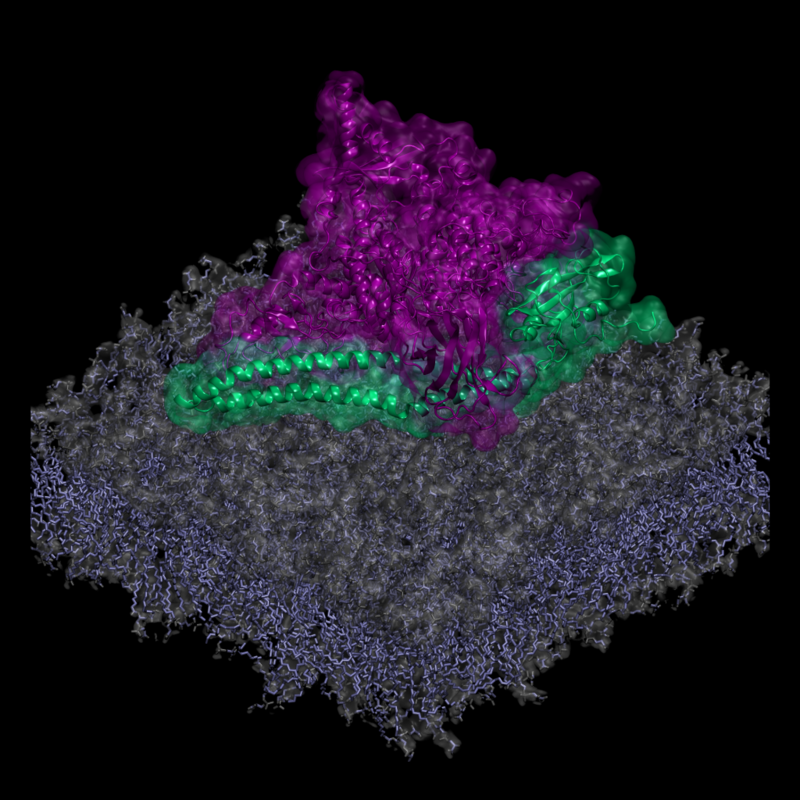 The catalytic and regulatory subunits of the protein are shown in purple and green, respectively and the membrane is represented in grey. Learn how to setup and perform MD simulations. Analyze MD simulations with standard tools. Develop own tools and scripts for MD simulation analysis. Understand the protein function and dynamics. Natural science student (Chemistry or Physics) that have familiarity with or want to learn how to perform computer simulations. Week 1. Perform a NAMD and GROMACS Tutorial. Familiarize with linux. Week 2. Setup the protein system. Read the literature on PI3Ka. Week 3. Create the Work Plan. Familiarize with HPC resources on ARIS, creating and running batch scripts. Submit the MD jobs. Week 4. Familiriaze with analyses tools and perform test calculations on the trajectories. Week 5. Produce production trajectories. Week 7. Rationalize the results and gain insights into the mechanism of PI3Ka mutant function. Production and Analysis of a protein trajectory. A movie with the simulation outcome can be generated. The project can be made more difficult depending on the analyses that will be performed.